Back yard square beds - can you find them? 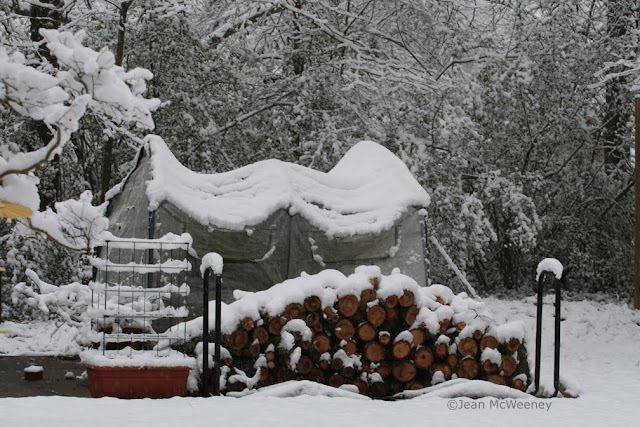 The type of greenhouse I have is portable, easy to pop-up, and apparently easy to collapse under snow. Definitely not recommended if you live in an area where it snows regularly. I've already done one bird count for the day. The birds have swarmed the feeders. I hope you can see the little cardinal above. The snow made many things look different. I love how the climbing rose bush looks. I think the neatest snow covered objects were the trees. It was a true winter wonderland. But the sun is out now and soon this will all be like a dream. Onward through the snow. We didn't get any in Austin, and I'm not really sorry. 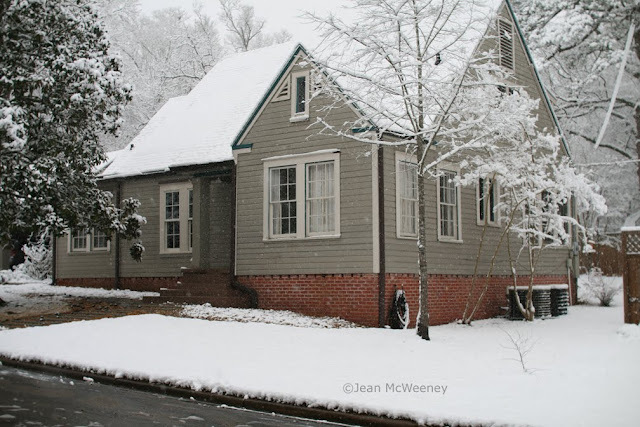 But your pics make me a little nostalgic for those occasional spring snows we'd get in S.C., where I grew up. Enjoy it while it lasts. Spring does seem as if it'll be late this year. So pretty! Reminds me of, well, here, where we also have a nice snow cover on everything. But then, we are supposed to in February. 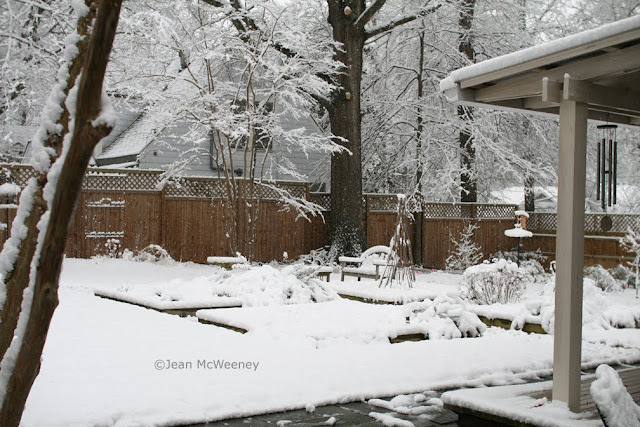 Hopefully your snow will melt soon and not do too much damage in the garden. Wow, it is beautiful. It totally missed the north part of Alabama but snow is predicted for Sunday. I'm glad you guys farther south got to enjoy it! 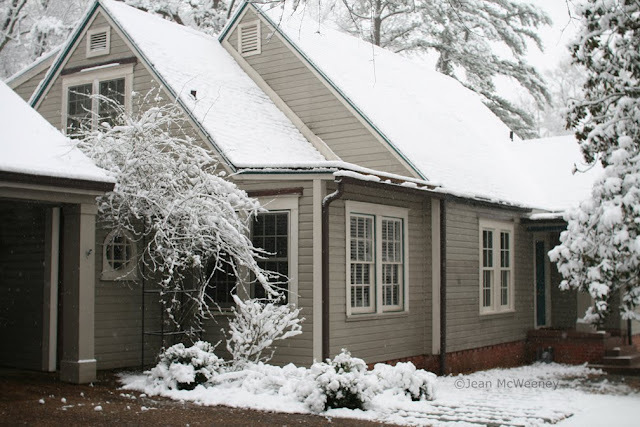 The nice thing about a Southern Style Snow....it doesn't last long. I see that you have plenty of wood to help keep you warm and I would have missed the pretty cardinal had you not mentioned it. I was so focused on the snow. Congrats on the SB win. I guess the Saints ain't the ain'ts anymore. I know it's inconvenient for warmer regions, but I still think snow looks so pretty! This is beautiful, Jean! As tired as I am of winter, the magical scenes created by a fresh snowfall still amaze me. Snow seems to have reached so many places this year that aren't used to it. No wonder Saints' fans think hell has frozen over! :) I watched the Super Bowl, sort of rooting for the Colts, but a part of me was hoping the Saints would win. Now if my Chicago Cubs get to the World Series this year, we'll really know the end of the world is near!! 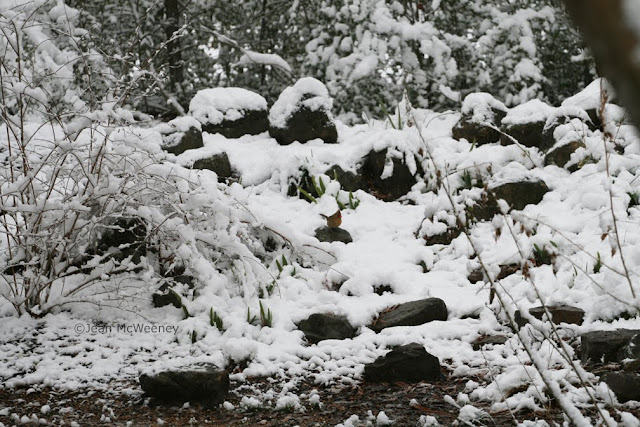 Your garden looks wonderful A covering of snow sometimes can be an asset to the plants, bringing out their winter structure. I wish we had had some because I would be feeling a lot better looking at my garden covered in snow. There is still time I guess and who knows with this freaky weather pattern. I hope your greenhouse survived and any plants you have inside. What kind of rose climbs up the house? I did see the mama cardinal. Even in the cold the cardinals are out singing. Jenny - the climbing rose is Madame Alfred Carriere. I haven't been brave enough to go into the greenhouse yet but I think everything should be fine. The possible exception to that might be the olive tree which was the tallest plant in there! 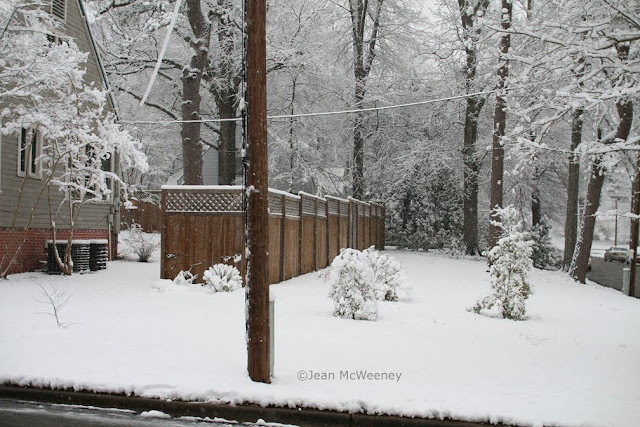 Jean, your gardens look lovely in the snow. Seeing your Mme Alfred against the house makes me inclined to move mine. She's on a split rail fence and has never really been happy there. Perhaps she'd rather go up than across. I've got to get a bluebird box and see if it will lure any to my garden. I loved the picture of yours! It missed us...again. I like snow. Especially, since we don't ever get much. Our old house, in DFW area, got lots this time, though. Your garden does look quite lovely, with its white blanket. I am SO ready for spring. Hope it's not too late, this year. 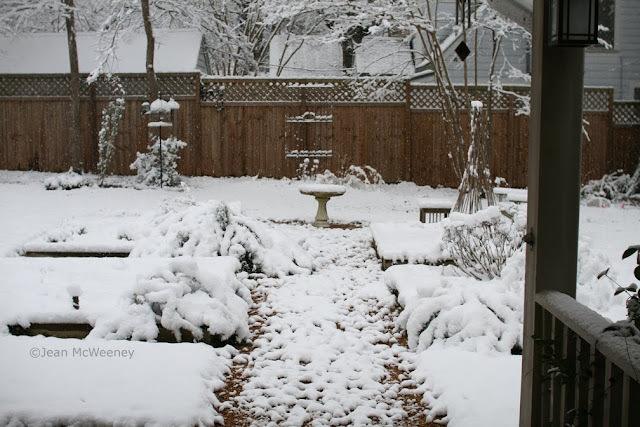 The daffodils and camellias will be ever so much more appreciated after this monochromatic blanket of white. Where is your snowman? Oh, the 'captcha' word today I have to type in to post is 'barke'. Appropriate. Had the snow from two nights ago until yesterday afternoon. It was fantastic, but the greatest thing is it doesn't stay around too long! Love your shots! The snow looks so pretty. We only had some fat, wet flakes for about 45 min, then rain again. I can't believe how bare the garden is this winter. Only my camellias are blooming and they have slowed down because of the cold. Can't wait for warmer weather. The climbing rose in the snow is really beautiful! We are in Durham, NC and have had 3 snow events so far unheard of here! Wild & crazy weather...but it looks just beautiful. That might be the last time you see snow like that in your lifetime! Let's hope so.